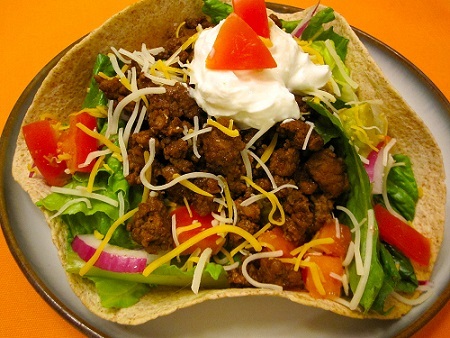 Here is a great Beef Taco Salad Recipe for you! The taco seasoning came from Mexico and when placed on or in a salad from America ...magic! 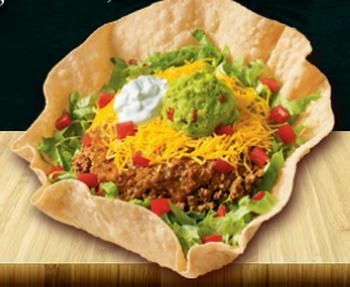 The taco salad was born. 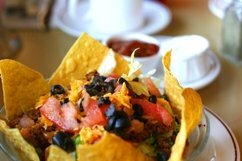 Taco salads can vary a great deal from region to region. You can use a basic salad recipe and tweak it to your hearts content. Preparation time: about 45 minutes. Serves 4-6. Like all of these recipes, this beef salad recipe is customer-tested and customer-approved. It is a real restaurant recipe. I know that every one of these real restaurant recipes will help you cook with confidence and style because each one has met the "ultimate test." Please "Click around" the website to find additional information and more proven restaurant recipes. And please "check in" often. More recipes and information are being added to the website all the time! Thank you for visiting. Enjoy your salad recipe and the company of those you share it with! Did you know? Mexican food has been always considered to be very spicy. Well, that is partially true. Mexican food history shows that Mexico has given chocolate to the world, as well as several other specialties, including peanuts, vanilla, beans, coconuts and tomatoes.